What a great device from REJUICE. 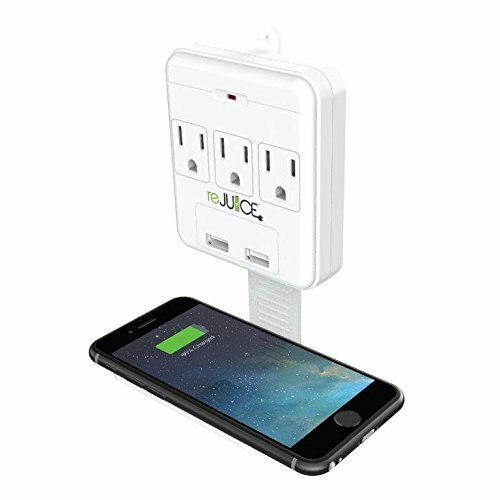 Whether on the table or in your office the REJUICE Charging Station takes the Award! With 2 USB Ports and 3 AC Outlets you wont believe all this can come in one small package! Use the handy PHONE HOLDER to keep your devices secure or watch movies easily. SUPER POWER: Power up to FIVE devices all at the same time. 3 AC PLUGS: Its like having your own power board! 2 PORT USB CHARGER: USB charging port that can charge any device & Fast! PHONE HOLDER: Amazing Phone Holder is a Great Treat! If you have any questions about this product by ReJuice, contact us by completing and submitting the form below. If you are looking for a specif part number, please include it with your message.